A popular swimming spot on Hawaii's Big Island evaporated. Hawaii's Green Lake was about 400 years old and one of the only freshwater lakes on the Big Island. But now, it's basically gone. Lava flowed into the lake Saturday and evaporated all of its water within hours. Officials reported seeing huge plumes of steam coming from the lake. Now, lava sits where 200 feet of water once was. "I've never even heard of anything like that happening before," said Drew Kapp, a geography instructor at Hawaii Community College. Related Story Why Are The Kilauea And Fuego Volcano Eruptions So Different? The Green Lake — located in a rainforest on the eastern side of the island — was a popular swimming spot for locals and tourists. 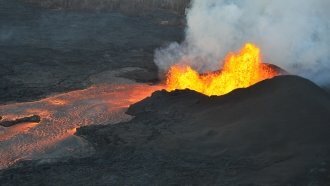 A spike in the Kilauea volcano's eruption began a little over a month ago. So far, lava has reportedly covered at least 5,000 acres, destroyed at least 279 homes and forced many evacuations.